12pm: Tree planting to buffer the power plant over the wall. 1:30pm: "How To Build a Community" performed by spoken word artists: Safahri Ra, GROW, Sallomé Hralima. 2:30pm: Shabazz Jackson, propietor of Greenway, Boilogical Waste Management and Troy Lancaster, Founder of Dread Scott Bird Sanctuary in the South Bronx will speak on the importance of community involvement in determining local land use. DOPE SWAN is a community arts organization focused on providing outlets that support and engage emerging creative talents within the visual and performing arts. Through collaborations with underrepresented artists and partnerships with educators, activists and community leaders, DOPE SWAN works to strengthen the connections between art, livelihood and community. After over a year in absence the Green Circus returns to the South Bronx with new members, to share sweet potato chips, show the folks how sweet potatoes are grown, share sumac tea and discuss the many uses of willows. This marks the first, but not the last collaboration between the Green Circus and the many increadible programs taking place in the South Bronx at New Settlement Apts. Stain Bar 766 Grand St. 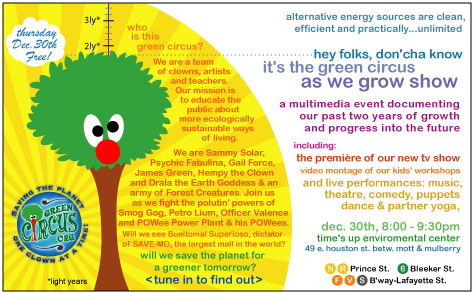 The Green Circus will present new work and have new media available for purchase. The Green Circus will be working with the Puppetistas who have a circus called Uncle Sam and his Little Global Circus. The Green Circus will be meeting atendies and bringing them into the evening event as part of the Eco-Metropolis Conference which lasts all weekend. CUNY TV can be viewed on most cable systems in the New York metropolitan area on Channel 75* as part of NYC TV, the City's cable television network. * Some RCN digital cable and MMDS systems carry CUNY TV and/or NYC TV on different channel numbers. For example, some RCN systems in Manhattan and Queens carry CUNY TV on channel 24, 106 or 108. Please consult your cable provider directly to be sure. The clever clowns lead a group of forest creature children on a march through the streets of Yonkers to promote the Bekzac Environmental Center, singing songs and improvising cheers. Smog Gog played some tunes with the guy from the materials exchange. The Green Circus performed, and again witnessed the increadible pagentry of Arm of the Sea, as they did their peice about the Hudson Estuary. Verde Verdanta and Hempy the Clown visited incognito to hear lectures on sustainible energy and plan for an appearance at this event next year. James Green and Rainbow Genesis met many stars of the green scene including Charez the rapping bio-diesle mechanic from grassoline.com. The Green Circus twice performed a new sketch about looking for peace. The first performance was on the Grove Stage in the Peace Village. The second was along the Peace Path followed a spectacular puppet show by Arm of the Sea. The Green Circus also met with Bread and Puppet on the 17th and Smog Gog performed his tribute to New Orleans for the first time ever. L train to 1st Ave, M9 to 12th St., M14 to 1st Ave. This was alot of fun dispite the rain, and the kids decorated instruments, played powerball and made their own super hero cards in Mr. Murry's church. We all watched some of the Green Circus DVD together. Green Circus has been offered chance to work with these kids again, either Aug 12th or 19th. Transportation and food was generously donated by More Gardens. The camp will be running until August 28th. For more info on the Animal Adventure Camp please call Aresh at: (718)-585-2109. The agenda is to give a human face to environmental issues; empower people to become active agents of sustainable and equitable development; promote an understanding that communities are pivotal to changing attitudes towards environmental issues; and advocate partnership which will ensure all nations and peoples enjoy a safer and more prosperous future. World Environment Day is a people's event with colourful activities such as street rallies, bicycle parades, green concerts, essays and poster competitions in schools, tree planting, as well as recycling and clean-up campaigns. 766 Grand St. L to Grand St. Colorful icon Hempy the Clown is arrested by Officer Valance, for unknown reasons. 141 St. and Brook Ave.
how to build your own web site, video production for youth and more. 65 5th Avenue between 13th and 14th Streets. Register on-line! or call Paper Tiger at (212) 420-9045. THE BIO TOUR Benefit party!! The evening will start at 9:00 with a brief update of the latest developments with the vegetable-powered BIO-BUS and related activities including projected pictures from our last cross-country trip! btwn 46th and 45th on 1st Ave. This event is in honor of environmentalist Wangari Maathai of Kenya winning the 2004 Nobel Peace Prize. 2005 begins the UN Decade of Education for Sustainable Development. The event highlights New York City youth addressing environmental injustice in their communities with presentations by youth, documentary film screenings, music and a peace heroes flag ceremony. Invited speakers include the great grandson of M.K. Gandhi. 600 middle and high school students re invited to participate in this peace education initiative honoring the lives of M.K. Gandhi and Martin Luther King, Jr.
Green Circus will be performing a new skit, "A Mock Trial on Environmental Justice". If you wish to attend, please register by January 14 to 212.246.2746 or Jwretzel@templeofunderstanding.org. 120 16th St. and 4th Ave.
M or R to Prospect Ave. The Green Circus will be showing shorts, performing and body-jaming workshop with James Green. Activists, locals and community organizers said a sad farewell to 3 beautiful South Bronx Gardens that had been built by children and adults from the community. The gardens were being bulldozed to make way for more apartments. The Green Circus performed, Hempy the Clown vs. Powee Powerplant hosted by Psychic Fabulina. Special Guests - Gail Force and Sammy Solar. Hempy was acompanied by his mentor James Green and the event was recorded by Green Circus Television reporter- Neo-Genesis. 3rd, 4th and 5th graders from P.S. 295's environmental enrichment class were taught about the local plants, did laughter meditation, yoga and energy ball, learned how to make recycled instruments out of rubberbands, bottles and cans, and drew super-hero self-portraits using googly eyes and juice from ink berries that they picked in the garden. School Librarian and mother; Susan Weseen called James Green only an hour later to thank The Green Circus and let them know that several students had told her that it was "The most fun (they) ever had." Students also decided that they wanted their class project to be on all the things you can make out of recycled objects. So once again, The Green Circus has paved the way to a brighter future by inspiring the leaders of tomoßrrow and showing them how to Keep it Clean and Keep it Green. and they taught 90 4th Graders things they never knew. they took these kids minds out to the stars. They learned, "Thanksgiving is the seasonal harvest." and so for that reason that, they turned into a forest. Later on they turned into a junkband chours. They went around the circle in groups of 22. Parents and Teachers? Yeah...they had a few. Harry from the garden and Ayer were there too. I think you'd say it was a nice little crew. and some got to draw with the side-walk chalk. Registration required as space is limited. All children must be accompanied by an adult. Kid-like adults may come without children. Our session will end with a short ceremony-show free to the Rockridge community at 4:15pm. We encourage you to bring your Halloween costumes and accessories for the show, as long as you can comfortably move in them. Jenny and Rana are certified in Circus Yoga from its creators, Kevin & Erin Maile O’Keefe of Circus Minimus in NYC. They have been teaching yoga and circus arts in after school programs, summer camps, and retreat centers across the country. They are currently teaching Circus Yoga classes in after school programs in San Francisco and the East Bay and are excited to share this work with the San Francisco/Bay Area yoga community. 2 day festival to experience, educate and enlighten humanity on the interconnectedness of all life. W218th St and Indian RD. with the communal ceremony and celebration of circus. (4) creative movement and physical comedy. in a short yet spectacular "Green Circus Super Kids!" 4pm performance presented by Rana Lee and Jenny Sauer-Klein on the DDOP Kid's Stage. just East of Columbus Ave.
Stilt construction will be led by Ruby from Wise Fool Community Arts, Stilt Walking led by Kerri from the Green Circus. A FREE shuttle will be available from the 24th st. Mission bart station leaving promptly for Woodshanti at 9:30 am both days, and returning there directly following the workshop. Look for a VW van with the Green Circus logo. We will be building wooden peg stilts in the tradition of Bread & Puppet, Heart of the Beast and Wise Fool. These low-tech, easily constructed stilts have an upright pole, a peg that your foot sits on and a wooden brace that rests against the knee for stability. The peg stilts are lightweight and thus easy to dance, jump and skip on. We will be building stilts that will raise you approximately 2-1/2 feet above the ground. This is an ideal size to learn on, as you can still be supported while learning by holding hands with people on the ground. The wood for the stilts will be pre-cut and prepared by Woodshanti. deadline is Monday, January 12th, along with a $55 deposit to secure your space and pre-cut stilts. Please call Jenny at the Green Circus to register 415 541 5646. The rest of the balance will be due in cash on the first day of the workshop. Please bring lunch for yourself and goodies to share. For more info, call Jenny at 415 541 5646, or email : jenny@greencircus.org. at Oddfellows Playhouse 128 Washington Street, Middletown, CT. The Festival was open to anyone interested in youth circus, though young people 12 and under must be accompanied by an adult. Youth performing groups will work together on a separate track from the Festival participants to prepare for a 5 pm performance in the theater. East New York After School Program for 8-10 kids, 10-13 y.old. Presented by the Urban League of Long Island and Shocklee Entertainment. This is a two-day outdoor & indoor event for children and families with an educational and personal development focus. Akoya-The Village Green-Dha Fuzion-Hello-The Lonely Samoans and MUCH more! Green Circus will be performing throughout this event. Art show, video screenings and performances.